We’d love your help. 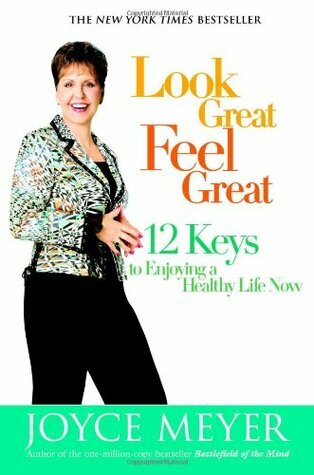 Let us know what’s wrong with this preview of Look Great, Feel Great by Joyce Meyer. Revealing 12 keys to reclaiming our health through such things as exercise, eating habits, soul care and responsibility, Meyer uses her engaging style to reveal how simple the restoration process really is. To ask other readers questions about Look Great, Feel Great, please sign up. I used this book to help me start getting in shape. After reading it I started walking at least 30 min per day,drinking water which I really didn't want to do, and in general trying to eat healthy. I am proud to say that I have lost 25 lbs and feel pretty good. It helped me a lot to view this whole "diet" stuff from a different perspective. Nowadays everything is about looks and beauty. But through this book I learnt that its actually about pleasing God and not yourself or others. If you get this point you will have a better stability in pulling things through, because after all: You are pulling them through for God. That gives it a higher reason. So I knocked it out of my head to do things for my glory: I want to look good, I want to loose weight, I wa It helped me a lot to view this whole "diet" stuff from a different perspective. Nowadays everything is about looks and beauty. But through this book I learnt that it´s actually about pleasing God and not yourself or others. So I knocked it out of my head to do things for my glory: I want to look good, I want to loose weight, I want to please my boyfriend by having a slim body... etc. I knocked these thoughts out of my head and focussed on doing the right thing for God´s glory, which is exercising, eating right and drinking a lot. Actually I was started doing everything you would do when you are on a diet. But because I had in mind to please God and not myself I pulled it through. And I still am! It was such a relief to knock me and my own thoughts out of my head and putting God in the centre of my heart! The motivation is stronger AND I am doing it for a "higher" purpose. This the Lord blesses. Result: I lost over 5 pounds, bought new pants almost two sizes smaller and you know what? I don´t even care because as long as I´m trying to do what is right in God´s eyes everything else happens by itself. You do your best and God does the rest! That´s how we should think. If we do so, He blesses it. I have been a fan of Joyce Meyer for quite some time, but just started reading her books. This is the first one. I appreciate her message in helping us deal with the whole diet, exercise and weight issues that so many of us face, me included. I already knew a lot of the information, however she reminded me how important it was to deal with it constructively which I have not been doing. And keeping it Christian-centered brought it home for me. I feel more confident in my diet and exercise goals af I have been a fan of Joyce Meyer for quite some time, but just started reading her books. This is the first one. She did not have new information or techniques really new to me (as some one who reads a lot of weight loss books), but she did say it in a new way. And her emphasis on the health-related and disease prevention side of getting in shape and eating healthy was blunt and convicting. This seems like exactly the kind of book I would never read, but I picked it up as a curiosity at a used book store. I have read some of Meyer's other books. I don't take her words for gospel, but she does sometimes have good insights and anecdotes about life. I suppose for someone that is totally ignorant of eating healthy and treating your body well, this may be a good book to start with. The author starts with working on what you keep telling yourself and how to change the dialog to yourself. We need to move/exercise. There's no way around this. Our bodies were made for action/activities and sitting in front of the stupid box (TV) or a computer all day or in a vehicle, just isn't going to give the movement our bodies need. We m I suppose for someone that is totally ignorant of eating healthy and treating your body well, this may be a good book to start with. The author starts with working on what you keep telling yourself and how to change the dialog to yourself. We must eat what is natural and not man-made. And of course, everything in moderation. This was an audio book I listened to help me keep on track with my New Year's Resolutions. I always have the best intentions each year to exercise more and eat healthy. The dieting isn't too hard, but an exercise routine is more difficult for me. Joyce Meyers is encouraging and will motivate you with this book. I really was inspired to drink more water after Key #6 Water Your Life. I also need to heed the advice about de-stressing. I recommend this book to anyone who needs an extra push to get o This was an audio book I listened to help me keep on track with my New Year's Resolutions. I always have the best intentions each year to exercise more and eat healthy. The dieting isn't too hard, but an exercise routine is more difficult for me. Joyce Meyers is encouraging and will motivate you with this book. I really was inspired to drink more water after Key #6 Water Your Life. I also need to heed the advice about de-stressing. I recommend this book to anyone who needs an extra push to get on track ... physically and spiritually, myself included. I'd read this again. I have been blessed to pick up several books over the last few weeks that have been just what I needed in my personal "gas tank" and this was one of those little boosts! I thought that the explanations and examples provided about the body's way of handling food and such were great and made things very understandable! While many of the points are ones we all probably say "Duh" to, I really enjoyed the way it was communicated and hope to be able to implement the tips and ideas into my life. So, I'm trying to get rid of some pounds and want to put God first. I found a lot of helpful hints and tips in this book. I read though it so fast that I'm going to try to read it though a second time so I can apply a lot of the suggestions to my lifestyle. My only complaint is that it feels repetitive. I know diet and exercise are important, so maybe its time to put down the books and just pray! Joyce Meyer does a great job explaining the WHYs of a healthy lifestyle: why certain things make you sick, tired, fat... WHY exercise, healthy eating, etc. make you healthier. Obviously we all already know that eating healthier and exercising regularly are good for you. But WHY? Joyce explains how these things affect your body and she does so in a very easy to understand way. This is definitely not the first book I've read concerning health and nutrition, so I wondered if I would really learn anything new. Leave it to Joyce to add a fresh perspective and do it in a way that balances technical nutrition with practical understanding - with a touch of good, blunt humor. It was a powerful combination. A friend gave me this book during a time I was depressed. She thought it would help. I had a tough time getting through the introduction! Its to religious for me. From the titles of her chapters it seems like she some interesting things to say that would be healthy and helpful but I probably will not ever finishing reading it. Excellent!!! Very well researched, yet easy to read and understand. She combines Scripture with medical facts and how our bodies work. I read it quickly and learned a lot about how God created us and how we are meant to function. it was very helpful,eye opening and informative.it teaches us how to view our bodies in a different light,how to focus on our over all health,making lifestyle changes and not just quick fixes like losing weight for a certain occasion or period.Lovely read,i enjoyed it immensely. Life style change not diet!! Loved the wisdom of removing one unhealthy thing at a time. If you remove all at once , we feel deprived and are more likely to fall of the wagon. Remove an item and don't remove the next until you are ready. First thing I removed was half & half cream from my coffee.. This book is great!!! It teaches you how easy it is to live a healthy life. It has been a great motivator for me to get started. There are pages in the back of the book I am going to make copies of to keep on hand so I can keep myself on track. This book was nice and positive. I don't agree with all of what she's said (go ahead and drink diet sodas,) but the best part of the book were the suggestions for action at the end of each key. It was fine mind fluff after hours of the sociopath book I just finished. I actually listened to this as an audio book. I probably need to go back and listen to it again. I don't remember too much about it. I know I always enjoy Joyce's books and get a lot out of them though. Ladies, you will be amazed at the transparent way Joyce tells it like it is. Your body is the temple of the Holy Ghost . . . so do your best to take care of it and LET God do the rest. HE will help you. Look great, feel great and be blessed. I listened to this in my car. I enjoyed it, she gets rather medically technical, but in an easy to understand way. I would have given it a 5 if she would have done the audio. I like listening to her read the book, instead! I was hoping for something a little less physical health oriented and more spiritual-health oriented. In general, I do like Joyce Meyer's books. If you're looking to lose weight and strenghten your relationship with God, try this book. I'm Glad I am not the only one who finds these things, diet, exercise, and right thinking, not always so easy. Joyce Meyer's style is so welcoming and embracing that I feel as if I am getting good advice from a friend. Lots of fabulous tips for anyone looking to start a wellness journey. I even learned a few new things along the way. LOVE the biblical perspective and feel invigorated about keeping on with my health journey.. This book is a must read for anyone wanting to make a lifetime change in there weight and or life. Full of inspiration and insight, great tips and of course tell it like it is talk from joyce She is the best!!!!!!!!!! This will be a good book to refer back to as I move forward to better my health. I will try to remember to be patient in changing my current habits into a good live style. Joyce Meyer is one of the world's leading practical Bible teachers. A New York Times bestselling author, Joyce’s books have helped millions of people find hope and restoration through Jesus Christ. Through Joyce Meyer Ministries, Joyce teaches on a number of topics with a particular focus on how the Word of God applies to our everyday lives. Her candid communication style allows her to share openl Joyce Meyer is one of the world's leading practical Bible teachers. A New York Times bestselling author, Joyce’s books have helped millions of people find hope and restoration through Jesus Christ. Through Joyce Meyer Ministries, Joyce teaches on a number of topics with a particular focus on how the Word of God applies to our everyday lives. Her candid communication style allows her to share openly and practically about her experiences so others can apply what she has learned to their lives.